Our team of foot and ankle specialists and staff believe that informed patients are better equipped to make decisions regarding their health and well being. For your personal use, we have created an extensive patient library covering an array of educational topics. Browse through these diagnoses and treatments to learn more about topics of interest to you. Or, for a more comprehensive search of our entire Web site, enter your term(s) in the search bar provided. Also, you may click on the following link for more in-depth discussions on various foot and ankle topics at our blog: Salt Lake Podiatry Center Blog. As always, please feel free to contact our office to have any questions or concerns answered. What Is a Tailor’s Bunion? 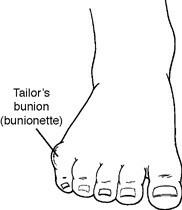 Tailor’s bunion, also called a bunionette, is a prominence of the fifth metatarsal bone at the base of the little toe. The metatarsals are the five long bones of the foot. 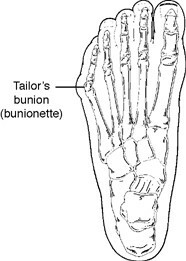 The prominence that characterizes a tailor’s bunion occurs at the metatarsal “head,” located at the far end of the bone where it meets the toe. Tailor’s bunions are not as common as bunions, which occur on the inside of the foot, but they are similar in symptoms and causes. Why is it called a tailor’s bunion? The deformity received its name centuries ago, when tailors sat cross-legged all day with the outside edge of their feet rubbing on the ground. This constant rubbing led to a painful bump at the base of the little toe. Often a tailor’s bunion is caused by an inherited faulty mechanical structure of the foot. In these cases, changes occur in the foot’s bony framework, resulting in the development of an enlargement. The fifth metatarsal bone starts to protrude outward, while the little toe moves inward. This shift creates a bump on the outside of the foot that becomes irritated whenever a shoe presses against it. Sometimes a tailor’s bunion is actually a bony spur (an outgrowth of bone) on the side of the fifth metatarsal head. Regardless of the cause, the symptoms of a tailor’s bunion are usually aggravated by wearing shoes that are too narrow in the toe, producing constant rubbing and pressure. The symptoms of tailor’s bunions include redness, swelling, and pain at the site of the enlargement. These symptoms occur when wearing shoes that rub against the enlargement, irritating the soft tissues underneath the skin and producing inflammation. Tailor’s bunion is easily diagnosed because the protrusion is visually apparent. X-rays may be ordered to help the foot and ankle surgeon determine the cause and extent of the deformity. Shoe modifications. Choose shoes that have a wide toe box, and avoid those with pointed toes or high heels. Padding. Bunionette pads placed over the area may help reduce pain. Oral medications. Nonsteroidal anti-inflammatory drugs (NSAIDs), such as ibuprofen, may help relieve the pain and inflammation. Icing. An ice pack may be applied to reduce pain and inflammation. Wrap the pack in a thin towel rather than placing ice directly on your skin. Injection therapy. Injections of corticosteroid may be used to treat the inflamed tissue around the joint. Surgery is often considered when pain continues despite the above approaches. In selecting the procedure or combination of procedures for your case, the foot and ankle surgeon will take into consideration the extent of your deformity based on the x-ray findings, your age, your activity level, and other factors. The length of the recovery period will vary, depending on the procedure or procedures performed. What Is Causing My Foot Pain? Proudly providing foot and ankle care for professional, college, highschool and beginner athletes for over 40 years.